I was pretty sure I had nailed this recipe for an AIP friendly fried fish the minute I took the first filet out of the fryer and broke through the crispy coating. 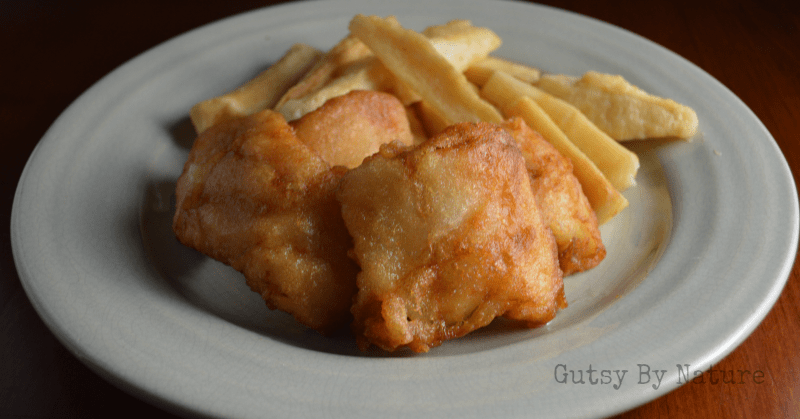 Popping that morsel in my mouth confirmed it and instantly took me back to my Wisconsin childhood… the only difference was that this fried fish is gluten free, grain free, dairy free, and egg free – but you’d never guess it! We all know that fish and chips is a ubiquitous takeaway food throughout much of the English speaking world, particularly in the United Kingdom. And in many parts of the United States, fried fish dishes are special offerings in restaurants on Friday nights – particularly during Lent when Roman Catholics traditionally abstain from eating meat on Fridays. But where I grew up in Wisconsin, the Friday “fish fry” is a year round tradition enjoyed by folks of all religious backgrounds. More than just a meal, a fish fry is an event. You can find it on any Friday night throughout the state at bars, dinner restaurants known as “supper clubs,” and even in church basements and civic halls like the VFW as fundraisers. Traditionally, the featured food at a Wisconsin fish fry consists of a beer battered white fish such as cod, perch, walleye, or (my favorite) bluegill and is served with french fries or perhaps a potato pancake, coleslaw, tartar sauce, and maybe baked beans. Though I love all those traditional accompaniments, for my paleo fish and chips I turned to my favorite AIP-friendly “chips”… yuca fries! Check out the recipe on The Domestic Man’s blog for more information. The nice thing about yuca fries is that they actually hold up pretty well in a warm oven, so you can make them first and just spread them on a baking sheet and keep warm while you turn your attention to the fish. When I set out to recreate my childhood favorite deep fried fish and make it suitable not only for my gluten free dietary needs, but also something that people who are on the elimination phase of the paleo autoimmune protocol (AIP) would be able to eat, I had three challenges. First, flour. I needed something that would mimic wheat flour but be nut free, so the recipes I found online that called for almond flour were out. Second, I couldn’t use eggs if it was going to be AIP-friendly. Not all traditional recipes use them, but experts tell me they make a thicker crust on the final product which many people prefer and they help the batter adhere better to the fish. And perhaps most importantly, I needed a suitable gluten-free replacement for the beer. I answered the flour and egg conundrum with two ingredients from the same source: cassava flour and tapioca starch. They come from the same plant but don’t confuse the two; tapioca starch is just a fine powder of virtually pure starch while cassava flour is the entire cassava (also known as yuca) root peeled, dried and ground into a flour that can be used just like wheat flour. I also used tapioca starch to lightly dust the filets so the batter would adhere better. IMPORTANT! I created and tested this recipe with Otto’s Natural Cassava Flour. You may be able to find other brands of cassava flour in ethnic markets or online, but please know that it may not have the same taste or texture. My inspiration for replacing the beer comes directly from my friend Kelly Bejelly who famously uses kombucha in a recipe for onion rings in her yummy book Paleo Eats. This “kombucha batter” may not be authentic, but I think it is delicious! If you don’t have plain kombucha on hand, feel free to substitute an equal amount of gluten-free beer or even just sparkling water. Interested in making your own kombucha? Check out the post I wrote about making my first batch! You may also like this book on all things kombucha. I both love and hate that it is quite small. I love that it is easy to store and doesn’t require a lot of oil, but I hate that I have to cook in batches. If you don’t have a deep fryer, use a large pot like a dutch oven and a thermometer to keep the temperature at 375 degrees. This is the frying method I used until recently when I finally got my little deep fryer and this is the thermometer that I used. This is an homage to the fish fries of my Wisconsin childhood, but this version is gluten free, grain free, dairy free, nut free, and egg free! Heat oil to 375 degrees. If not using a deep fryer, make sure you use a deep pot to minimize splattering and pay careful attention to the temperature so that it does not get too hot or drop too much when the fish is added. Mix the cassava flour, kombucha, and salt in a shallow bowl with a fork. Add up to ⅓ cup water to form a thick but liquid batter. Place the tapioca starch in a separate shallow dish and lightly coat all sides of the cod. Working in batches if necessary, drop the cod fillets in the batter and turn to coat. Allow some of the excess to drip off and then transfer to the hot oil. Cook for 3-5 minutes, or until the batter is golden brown. Remove from the oil and allow to drain on a wire rack set over a cookie sheet. Serve as quickly as you can - like all fried fish, this tastes best straight out of the fryer and will lose its crispiness if it sits for too long. Any other flour I can use, I’m allergic to cassava, and tapioca? I’m usually ok with subbing the tapioca for arrowroot in recipes. But the actual cassava, not sure how to substitute that one. I really don’t know of any flour that is comparable to the cassava flour. If you can eat nuts, there are a number of paleo fish and chips recipes on the internet that use almond flour… Sorry, wish I could be more help! Hi Jaime! 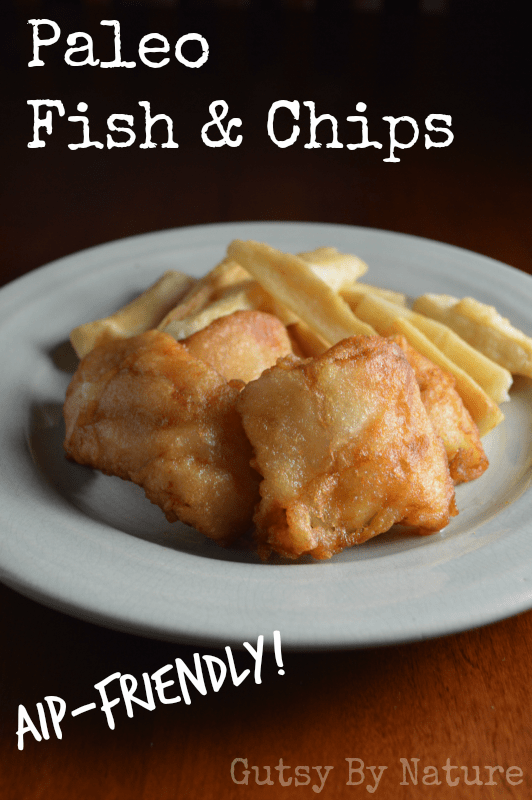 Thanks for sharing this recipe – I’m about 3 weeks in to my AIP healing journey and growing up in Minnesota, then living in Wisconsin for awhile, I can totally relate to all the fish fry’s at supper clubs! Such a great idea to use kombucha for the batter. Look forward to connecting more. Ya Hey Dere, I’m so excited for fish fry Friday! Thank you!! Hi! This looks great! Is there any sub for the kombucha? I think hard cider would be great, or if you don’t want to use alcohol, club soda would also work. I appreciate the effort but I made this tonight and it was an epic fail. I followed the recipe exactly so it wasn’t user error. The end result was fish covered in an inedible coating of goo. It was so bad it went in the garbage, along with the money wasted on local fish and other expensive ingredients. Bummer. Oh no! I’m so sorry to hear that. I’ve seen a lot of people post pictures of this on social media and report that they liked it very much, so I’m not sure what went wrong. I wonder if perhaps your thermometer malfunctioned and the oil wasn’t as hot as it needed to be? I didn’t have cassava for so I boiled yuca, popped it in the food processor and proceeded from there, subbing the yuca for the cassava. I used garlic kombucha and thinned out out to the right consistency with water. It was awesome!!! Perfect batter fried fish. We’ll definitely be having this again. Great thinking! I’m glad it worked out. I’ll remember that idea when people tell me they can’t get cassava flour. I never have been one for fried foods but I’m really craving this. I’m using avocado oil…but it is so expensive! Does anyone know if it’s ok to reserve the avocado oil for another deep fry batch in the next week or two maybe? I wouldn’t want to keep it any longer than that. I’m wondering about straining and reserving it … but since it’s fish, that might be a game changer too. Any thoughts from someone who is a “fried foodie”? I just found your recipe recently and tired it. It worked amazingly well!! Thank you! I was just wondering if I could use the same batter to coat chicken thigh pieces (boneless and skinless of course) to create my own crispy chicken nuggets. Do you think the oil temperature would still be 375? Yes, I think the batter would work fine for chicken pieces and you’d keep the oil temperature the same… but I couldn’t tell you how long it would take. Chicken takes longer than fish, but it depends on how big the pieces are. So I made this recipe using chicken tenders (each piece cut in half), and it worked wonderfully!! I added more salt to the flour, since I just used the club soda and regular water for the batter. I kept each piece in the oil until golden brown and the chicken was cooked through and very tender. Tastes better than store bought chicken nuggets!! !